In another exciting Ben 10 game, Ben is in trouble this time as he has transformed into Stinkfly and trying to escape evil Dr Animo’s farm. 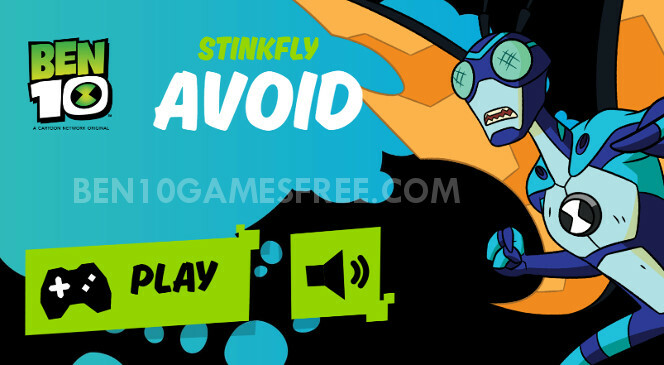 The Ben 10 Stinkfly Avoid game is all about avoiding Stinkfly from being captured by Animo’s deadly pig henchmen! Its not as easy as it sounds, so, before you start to play the game, first get yourself familiar with the gameplay. The Ben 10 Stinkfly Avoid game is set up in the farms of Dr Aloysius Animo who is an mad scientist. He is known for his evil genetic experiments involving animals and humans. Ben was in Animo’s farm to stop him from mutating human DNA with pigs but he must escape before the pig henchman get more powerful. So, he turns into Stinkfly and flies across the farm as pigs try to catch him. Recommended: Enjoyed this game? Play the exciting Ben 10 XLR8 Avoid game online now! In Ben 10 Stinkfly Avoid, you get to play as Ben’s flying alien, Stinkfly, who is flying his way out of the Animo’s farm. But, on the way, there are numerous mutant pigs waiting to him eat Stinkfly. Your task is to guide Stinkfly to make sure it does not hit any of pigs, else you’ll be dead meat for them. To move the Stinkfly up and down, you can use the up and down arrow keys. As the Stinkfly goes lighting fast, you have to be quick on the keys to avoid as many pigs you can. The score depends on the distance you cover without hitting any of the Animo’s pigs. The farther you go, the more you score! You can see your score on the top left corner of the screen. Once you hit a pig, the game ends and you have to start over again from the beginning itself! It’s time to fly like a bullet and avoid all the pigs to save Stinkfly from dying! Don’t Forget to give your rating for Ben 10 Stinkfly Avoid game and share your tips and tricks to win this game in the comments section below.